There is nothing more horrendous for parents than to see their child struggle in a battle for life. Sadly, that has been a very real nightmare for Patti and Al Gustafson. They watched their son Michael fight hard against pediatric cancer. They continue to bring hope to the others fighting childhood cancer through the Swifty Foundation. 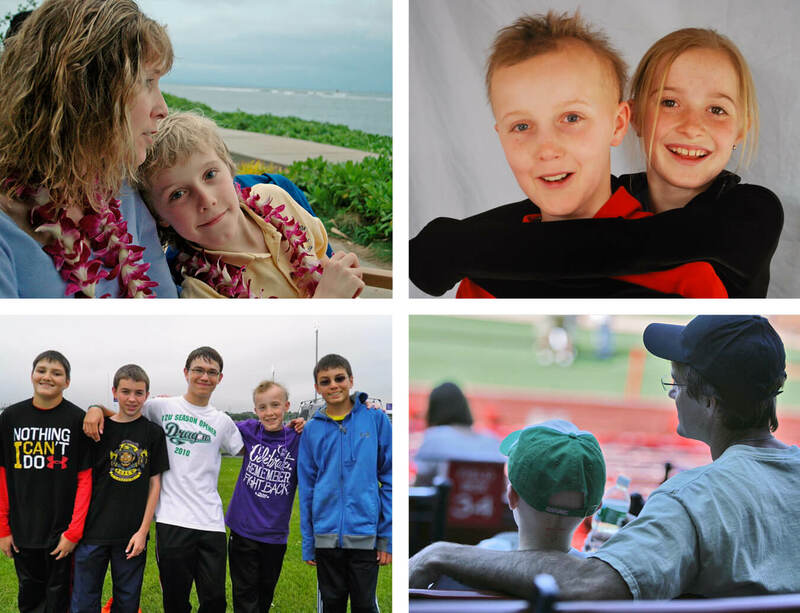 Michael was a generous spirit, and while he knew he wasn’t going to make it into adulthood, he still had a really big plan—his “master plan.” He was going to keep fighting even after death by donating his brain tissue for cancer research. The Swifty Foundation was created by Al and Patti to keep fighting the battle, too, through funding research and promoting awareness for developing improved pediatric brain cancer therapies. In the early days of the foundation, the Gustafsons came to Bureau Gravity with some basic communication needs. Over time, that relationship blossomed into a trust that helped Swifty realize an incredible goal. 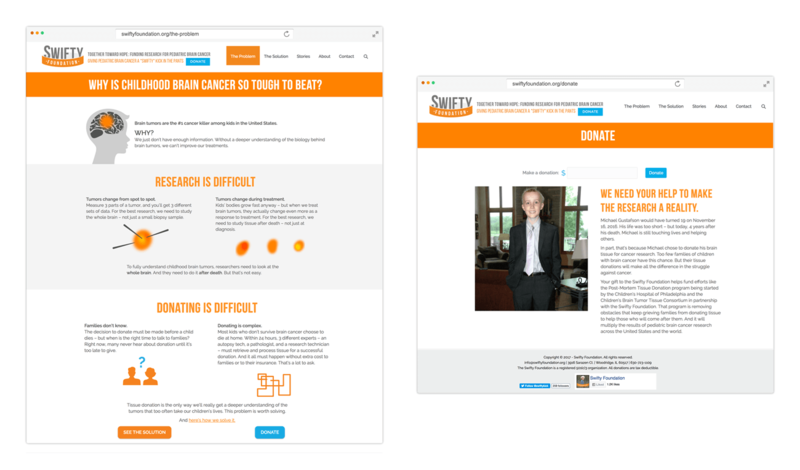 While Swifty’s mission took some time to evolve, by the middle of 2016, their sights were focused on one aspect: They wanted to increase the awareness and ability for families to donate post-mortem tissue—crucial for cancer research. The focus of their 2016 Annual Appeal would be to raise $300,000 to fund the Children’s Hospital of Philadelphia Post-Mortem Tissue Donation Protocol. The hospital had created a new program that both communicated the option of donation to parents and simplified the process. $300,000 would fully fund the program and be a major step in fulfilling Michael’s master plan. With the Gustafsons’ clearly defined goal, it was time to create a deeper strategy. 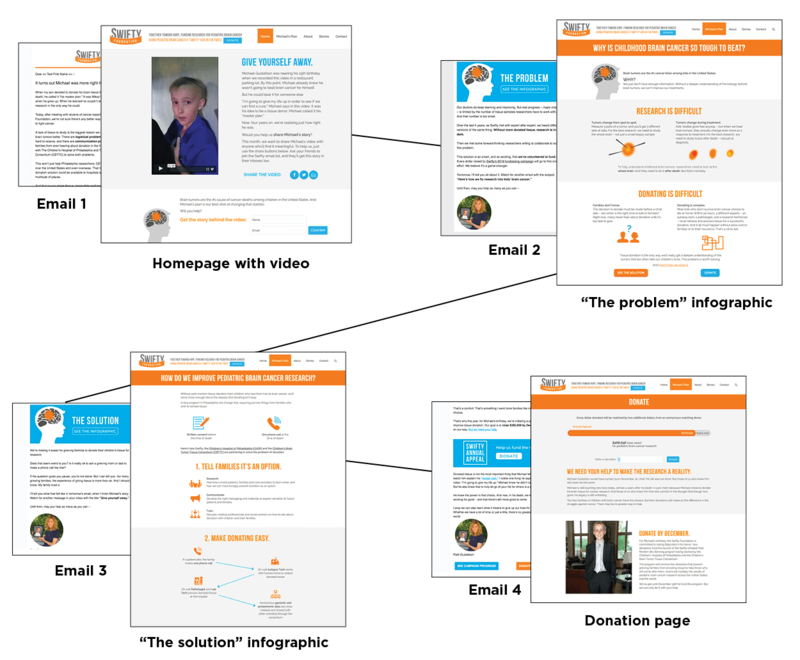 They needed to get their message across—explaining the complicated whats and hows of both the problem and the solution—in a way that enabled people to understand, care and take action. That’s not an easy message to deliver. Having worked with the Gustafsons for a couple years, Bureau Gravity strategist Benjie Hughes used his insight and skilled journalistic approach to create a comprehensive plan that would both communicate the complex challenges of pediatric cancer and why post-mortem tissue donation is part of the solution. 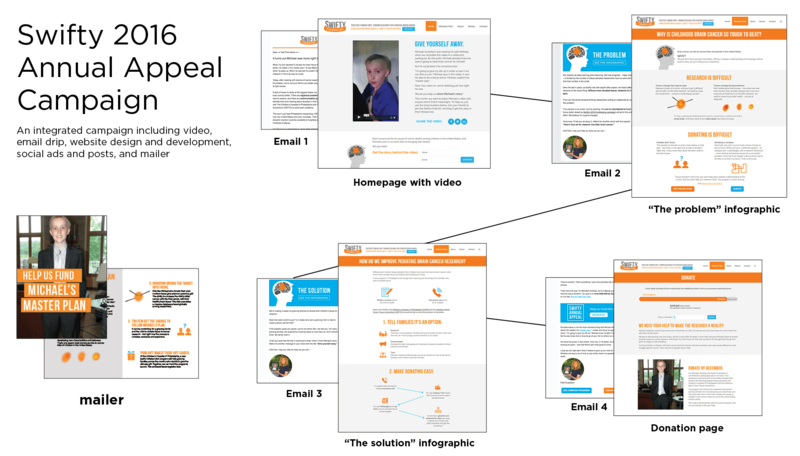 He created an integrated campaign that included video, direct mail, infographics, website design and development, social ads and posts and an email drip. The email drip was an instrumental component of the messaging strategy. It facilitated understanding by progressing from telling Michael’s moving story to outlining why and how donations to Swifty Foundation would make a difference. It had an open rate 25% higher than a typical non-profit response, and successfully drove people to the website to learn more and make their donations. Every aspect of the campaign performed very well, and in the end, the fundraiser surpassed its goal and raised $321,584—fully funding the Swifty-led Post-Mortem Tissue Donation Initiative at the Children’s Hospital of Philadelphia.